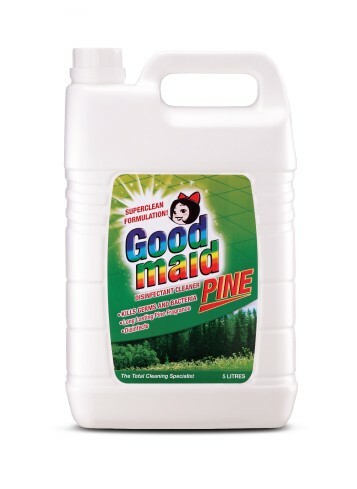 Pine Disinfectant Cleaner - Goodmaid Chemicals Corporation Sdn. Bhd. Contained with improved germicide and antibacterial properties that kills 99.9% of harmful germs and bacteria. • SUPERCLEAN Formulation that removes dirt and grease on surfaces easily and giving you a sparkling clean finish space. • Disinfects effectively with a pine scent to make your home smelling fresh and pleasant. • Provides a healthier living atmosphere after use. • Add 40-60ml to 4.5 litres of water. • Wipe over surfaces with mop or cloth. Allow to dry. With SUPERCLEAN Formulation for all floor types. Effectively cleans mosaic tiles, toilet bowl and colourless tiles. A multi-surface cleaner and sanitizer that removes all stubborn stains, fungal build-up and soap scrums. Effective cleaner without causing damage to coloured tile surfaces.